Run Junkie: Run Junkie in October Issue of "Trail Runner"
Run Junkie in October Issue of "Trail Runner"
The October issue of "Trail Runner" magazine proved a rare triple play for Run Junkie. 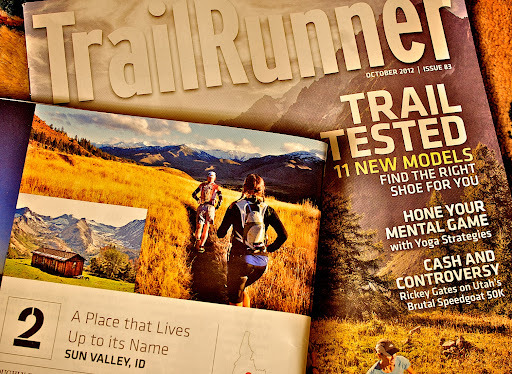 I got a chance to review (and get quoted on) Scott's Ice Runner shoe; I was lucky enough to answer some interview questions about Sun Valley from Meghan Hicks for her piece on the "8 Best Trail Towns;" and they ran two of my photos of two of my favorite local-area runs: one of Pioneer Cabin ("The higher you get, the higher you get"); the other of the Adams Gulch/Lake Creek area. The one big question from the issue: why was I the only shoe reviewer with an age tagged to his name? congrats Hank. You know I love the Pioneer Cabin photo! Funny I just read your post in Trail Runner. Even funnier-I'm putting together a sick new ultra up there called the "Standhope 60K." It will be next September 21st. You can check out the route at http://connect.garmin.com/course/2346156. See you later Hank!